ASUSTOR launches innovative enhanced version of the AiMaster mobile app. 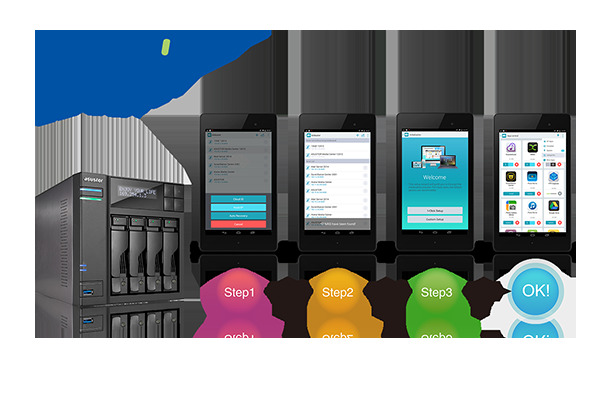 Offered first for Android users, it is the first mobile app in the NAS industry that features easy 4 step NAS system initialization, hard disk configuration and NAS App installation among other innovative functions, providing an innovative and user friendly mobile NAS experience. Taipei, Taiwan, February 11th, 2015 – ASUSTOR Inc., a leading innovator and provider of network storage solutions, has announced the release of the new innovatively enhanced version of the AiMaster mobile app. This new version of AiMaster is the first mobile app in the NAS industry that allows users to initialize their system and create RAID volumes along with other basic configurations. Users can also use AiMaster to log in to ASUSTOR’s App Central and install Apps for their NAS. Furthermore, users can connect to other related ASUSTOR Apps from within AiMaster, allowing them to quickly handle tasks such as finding files, viewing photos, listen to music or monitoring surveillance feeds. AiMaster helps users get these tasks done in the blink of an eye while taking the mobile NAS experience to the next level. ASUSTOR offers a variety of mobile apps that provide a wealth of convenient functions for all ASUSTOR NAS users. All ASUSTOR mobile apps provide three different connection methods (Cloud ID, Host IP and Auto Discovery) allowing users to easily access their NAS from within their local network or remotely over the Internet. Also supported are HTTPS encrypted connections and a passcode lock function which secure data transfers and connections while providing added privacy protection for mobile devices. AiMaster can be thought of as the mobile version of ADM (ASUSTOR’s NAS operating system). With AiMaster users will be able to grasp the system status of multiple NAS devices at any time while performing core system management tasks such as checking system information and resource usage, reading event logs, managing online users, executing USB One Touch Backup jobs, executing data backup and restoration, enabling and disabling system services, browsing App Central, managing NAS user access rights and customizing the AiMaster desktop wallpaper. Also worth mentioning are the Wake-on-LAN, Find Me and push notification functions in AiMaster that provide added convenience via centralized management to IT professionals working in server room environments. AiMaster is currently being first offered to Android users. AiMaster for iOS will be available in Q2 of 2015.